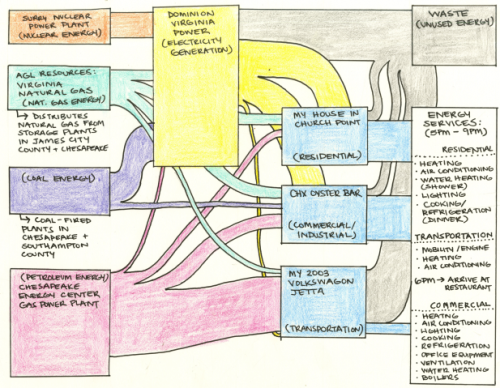 Probably inspired by one of the many energy flow Sankey diagrams, such as the one shown in my last post, Kelsey Bixler of the ‘This blog is a system.’ blog has decided to make her own, quite personal hand-drawn diagram. This seems to have been part of an assignment. Kelsey “analyzed the various activities that involved the consumption of energy in a four hour period” of a typical weekday, including her activities at home, the trip to work, and her job at Chick’s Oyster Bar. 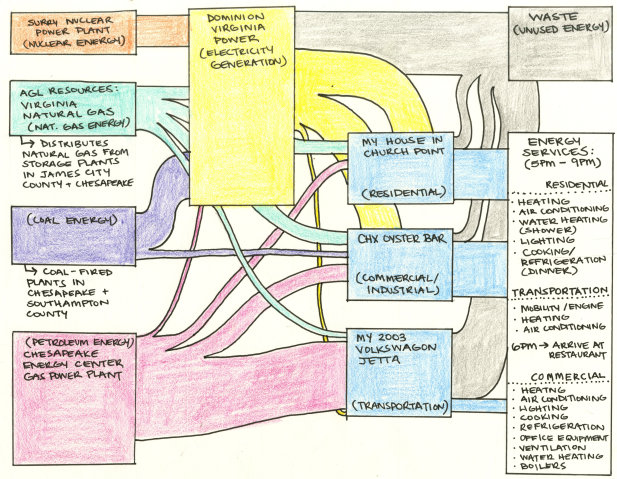 Now, who still says that we can’t do a Sankey diagram that shows the energy consumption caused by an individual? Of course, the actual quantities are not shown in Kelseys diagram, but it would be safe to say that this image is more or less true for an average American, who has a car, lives in a house and uses industry products. As a rough estimate I would just divide the 98 quads (mentioned as the overall primary energy demand in the 2010 U.S. Energy Sankey diagram) by the roughly 308 Mio. citizens. The proportions of the Sankey arrows would most likely stay the same. “From the body to the world” … every single one of us contributes to the big picture, and it is up to each of us to make this picture look different. Comments Off on Kelsey Bixler’s personal Sankey diagram	Tags: U.S.